Reconstruction remains one of the most contentious topics in American history. For a number of years, historians argued that Reconstruction had been counterproductive and had negatively impacted black-white relations in the South. And while a later school of historians offered a more sympathetic reassessment of Reconstruction’s intentions, former myths remain prevalent among laypeople. Unlike the Civil War itself, the accomplishments of Reconstruction remain unsettled more than 130 years after the fact. 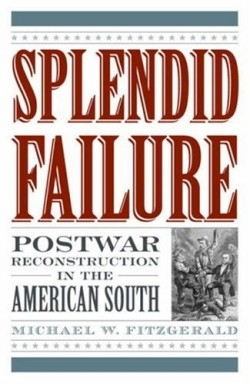 American History professor and author of numerous articles on the subject, Fitzgerald steps into this divisive arena in Splendid Failure: Postwar Reconstruction in the American South. The title itself may seem to give Fitzgerald’s stance away, but his narrative of the events that comprise Reconstruction is far too complex for a single position. Many elements—a social structure that had originated in the antebellum South, presumptions by both the Republican congress and Northern public, and individual ambition—created unstable alliances during Reconstruction. Further complicating matters, Northern commitment to Reconstruction waned as time passed, while white Southern compliance could never be taken at face value. Initially, Fitzgerald notes that continued resistance in the South following the Civil War spurred a more radical response than originally considered by Congress. Both President Andrew Johnson’s policies and a series of black codes in the South led Congressional moderates to join with radicals. While the Northern public had considered African-American enfranchisement too radical at first, it was deemed the most efficient way to achieve a balance of power in the South. Fitzgerald argues convincingly that it was Southern leadership, not the Radical Republicans, that shaped Reconstruction policy. Fitzgerald also offers a solid understanding of the intricacy of social relationships in the South after 1865. As Reconstruction continued, the Republican Party struggled to build a majority in the South. Eventually, the party emphasized railroad development, a policy that united freed people and ex-Whigs while also appealing to Northern supporters. Unfortunately, a number of states incurred large debts and bribery was rampant. As the reality of the fiasco set in, many blamed black legislatures for the mismanagement. Fitzgerald persuasively argues that these accusations were unfairly balanced. While multiple problems remained throughout Reconstruction, Fitzgerald documents important gains for African Americans and even a general acceptance of these gains by Southern whites. Although the South was hardly egalitarian after war, and while terrorist organizations like the Ku Klux Klan remained active, black Southerners voted, held local and national office, and had greater access to education and land. It was easy to mistake these gains as permanent on the eve of U.S. Grant’s landslide reelection in 1872. But a series of events, beginning with the depression of 1873 and followed by a Democratic sweep of the House in 1874, would harshly rearrange the nation’s politics. Splendid Failure offers a dense, thoughtful reconsideration of these turbulent events and their results. Reviewed by Ronald D. Lankford, Jr.